Now you can detect and correct bit flip and incorrect segment sizes with our brand new fixer! Learn how to fix FFV1 bit flip in our demo here, it's groovy. Also, the implementation checker now uses more features of Matroska's EBML Schema, including checks on the size of elements, ranges of values, more crc checks, a fix to Matroska interlacement tests, distinction between tests in Matroska's EBML Header versus the Segment Element, and a check for when Elements are too small to contain their mandates. The policy checker adds additional operators such as 'starts with' and 'does not exist'. The display of policy results is further optimized. 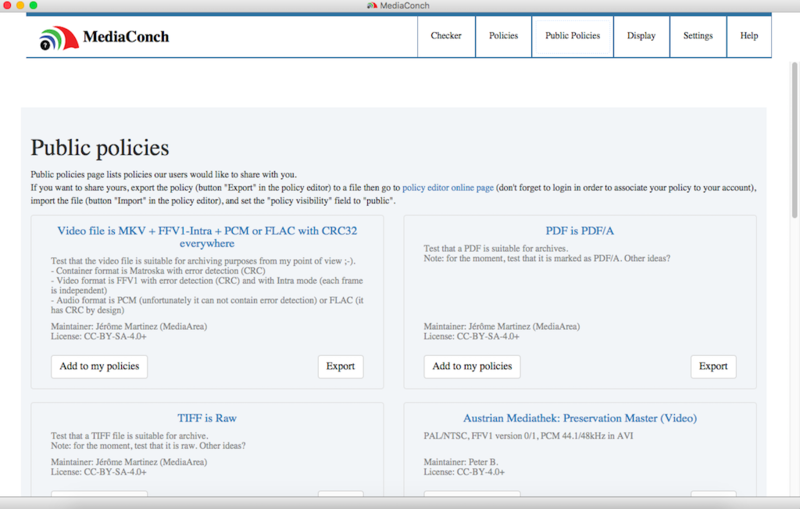 And lastly, you can now use, create, and share public policies with the community! Create, share, and use public policies! Jérôme and Guillaume will be sharing our progress at the PREFORMA Experience Workshop this week on November 23rd at Kulturforum in Berlin. You can still register here if you are able to attend! We had a great time connecting with the community at the annual AMIA conference during the second week of November where folks gave talks, tutorials, and made awesome posters about MediaConch implementation. Glad to see some of you! Dave and Natalie joined forces with the Archivematica team last month for a special webinar about how to use MediaConch as a micro-service and beyond. In case you missed it, both Dave's slides and the full presentation are online! Learn How to Migrate old policies created before the MediaConch 16.09 release.